The CoffeeShop Blog: CoffeeShop "Rose" Digital Paper Pack! CoffeeShop "Rose" Digital Paper Pack! Mother's Day actually ended up great. We made a delicious steak dinner and ate it with the boys (who had already messed up their rooms again of course ;-) on the front porch with candles and some really good red wine. The boys drank Kombucha in wine glasses, they really love that stuff as do we. It was a perfect evening, once I recovered from my cleaning frenzy. My husband is an optometrist and his doctor's assistant just had a baby this weekend, so I am working full-time in his clinic for several weeks until she gets back. My mother is watching the boys (and our dog) during the day at her house and I pick them up every night. This job has given me a full-appreciation of all of the work-outside-of-home moms out there. How do you guys do it??? My goodness, I get home completely exhausted! Now I understand why my husband sometimes falls asleep on his chair after dinner. I thought it was tiring working part-time from home and taking care of and homeschooling two boys, but that is nothing compared to working in a busy clinic. I really do enjoy being able to interact with patients (even thought they probably think I am a complete idiot! ), but I miss hanging out with the boys and also playing with my camera and computer… However, this job has been great for my brain because I am learning so many new things, and everyone working there is really nice and patient. So luckily I had made these papers a few weeks ago anticipating that I wouldn't have much computer time these weeks. You can use these papers in your digital designs, websites, storyboards, Facebook covers, etc. I hope you enjoy playing with them! I will have some storyboards and LR stuff later this week, and I am also putting together more actions. And soon things will be back to "normal" in the CoffeeShop household. 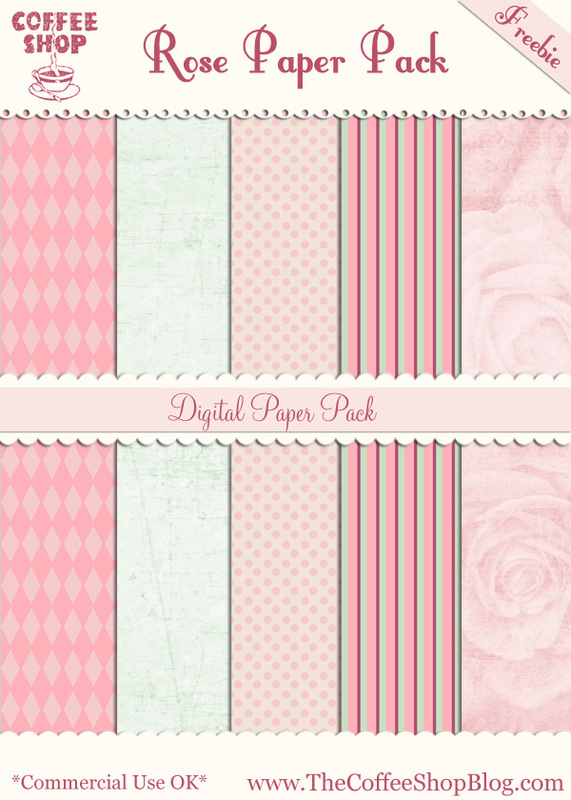 Download the free CoffeeShop Rose digital paper pack. You can also download it here. As usual, I love your papers and really appreciate your kind sharing, Rita! THANK YOU! what type of paper am i printing this on..white cardstock...or the color of the image cardstock?